I am sailing as tactician onboard the Super Yacht, Rosehearty, this week in the beautiful French Caribbean Island of St. Bart’s. Rosehearty is a 56 meter (182′) Perini Navi sailing yacht. We have a crew of 37 to handle the 500 ton vessel. 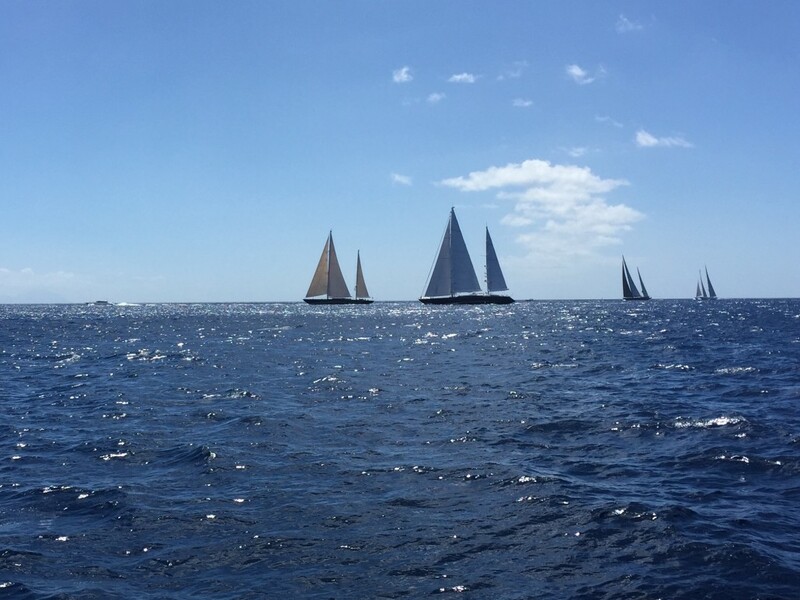 There are 32 yachts racing here this year. There are three races in the series, one race per day. The racing format of the racing is called “Persuit” racing. This means that the time allowances for handicapping the boats is done by varying the starting times of all the boats in the competition. In the first race in Friday, things really went our way and we won the race by 13 minutes. The race took about three hours and it was a “lap” of the island in the counterclockwise sense. The conditions were easterly winds of r14-18 knots and the big navy Perini’s sailed well in those conditions. Today’s race was more of a “zig=zag” course around some rocks to the northwest of the Island. The winds were in the 12 knot range. The more maneuver intensive course coupled with the lighter winds were more challenging for us. Still, we managed to get a second place to who Axia who finished third yesterday! So going into the final race tomorrow we have a 1 point lead over Axia. IT always comes down to the last race.